Emily has been working in the dental field for the past six years. 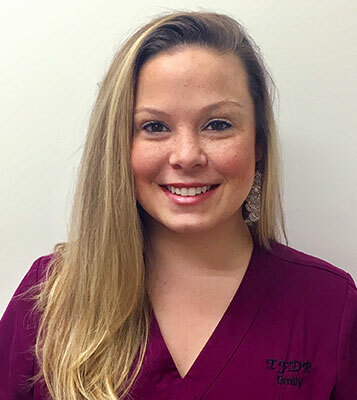 She started working at Tyngsboro Family Dental Practice in 2015 as a receptionist and transitioned into Office Manager in 2016. Emily has many responsibilities in the office including insurance, billing and treatment planning. She enjoys interacting with the patients of the practice answering questions, addressing concerns, and guiding them through treatment plans. Outside of the office, Emily enjoys spending time with her husband and her dog, Joey.